The authorities in the United Arab Emirates (UAE) must ensure that the investigation into the death of a British citizen who died while in police custody is impartial and independent, Amnesty International said today. Lee Bradley Brown, 39, died on Tuesday in Dubai, six days after he was arrested by police and amid allegations that he was assaulted in police custody. “The UAE authorities must quickly get to the bottom of what occurred by carrying out a full and thorough investigation,” said Malcolm Smart, Amnesty International’s director for the Middle East and North Africa. Lee Bradley Brown is reported to have been on holiday in Dubai when he was arrested on 6 April following an altercation at a luxury hotel. He was taken to a local police station where, it is alleged, he was assaulted by police officers before being confined to a cell. He died six days later after choking on his own vomit, according to the Dubai authorities. The Dubai police have told Amnesty International that the death is being investigated by their Criminal Investigation Department. “We welcome the fact that an investigation is already underway but it is not sufficiently independent if, as it appears, one branch of the police is investigating alleged abuses by other police,” said Malcolm Smart. Authorities said Lee Bradley Brown, 39, of Dagenham in Essex had had died of natural causes despite witnesses seeing him being ‘beaten to a pulp’ by prison guards. Lee Bradley Brown, 39, was on holiday at a £1,000-a-night hotel when he was arrested for assault and swearing and thrown into a filthy cell. Lee Bradley Brown, 39, was on holiday at a £1,000-a-night hotel in the Arab state when he was thrown into a filthy cell at the notoriously brutal Bur Dubai police station. Amnesty International has called on the Bahraini authorities to ensure the safety of three human rights activists after text messages were yesterday circulated to many people in Bahrain calling for them to be killed. The messages contained personal details of the activists and labelled them “advocates of subversion”. One of the three then received a series of anonymous threats from callers to his phone. “The Bahraini authorities must mount an immediate, thorough investigation to identify the source of these threats and bring to justice those responsible for inciting murder and issuing death threats,” said Malcolm Smart, Amnesty International’s director for the Middle East and North Africa. The unrest in Bahrain started with a “Day of Rage” on 14 February in which one protestor was killed by the security forces. Six more protestors were killed in the following days and hundreds injured, many due to the use of excessive and lethal force by riot police and other security forces. The worst incidents occurred on 17 February when the police carried out an early morning raid to clear demonstrators camped at the Pearl Roundabout in the capital Manama, killing five protestors and assaulting ambulance staff and medical workers seeking to assist the wounded. 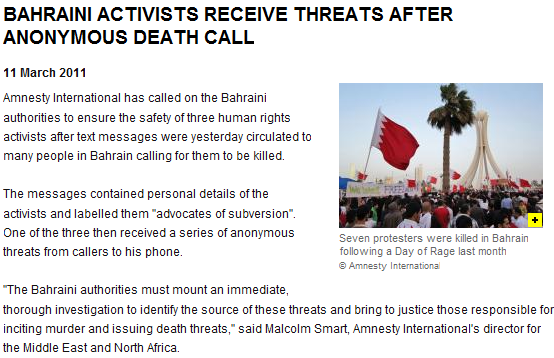 One of the activists named in yesterday’s text message, Mahmmad al-Maskati from the Bahrain Youth Society for Human Rights, told Amnesty International he has received around 11 anonymous threatening phone calls since the message calling for him to be killed was circulated yesterday. All callers delivered broadly the same message: ‘You are a donkey. We will kill you. We want you to stop going to the (Pearl) roundabout. If you don’t stop your human rights business we will f*** you”. Another activist from the same organization, Naji Fateel, said he had received two messages along similar lines. The other named activist was Abdulhadi Alkhawaja, formerly the Middle East and North Africa director for Frontline, an NGO which supports human rights defenders. The circulated message contained all the information about the activists that would be found on a national ID card: their full name, home address, photograph, personal ID number and employment, along with their telephone numbers. This has prompted suspicion that the threats may emanate from Bahraini security officials, who would have easy access to such details, or from people acting on their behalf. “The authorities must urgently probe whether these threats are the work of Bahraini security or intelligence officials and are intended to deter the activists from continuing their human rights work and involvement in protests demanding reform in Bahrain,” said Malcolm Smart. The text messages reportedly follow the wide circulation of a leaflet a few days ago which contained the photographs and names of a number of human rights defenders and opposition political activists who, it said, were to be targeted.